As I said here, I like to plan. Not only getting out the things I need for the next day, but also planning what I do each day, and when. 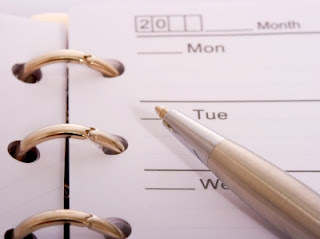 I have a diary, the old-fashioned paper kind you keep in your handbag - I'm a pen and paper kind of girl ;-) I do use the calendar function on my phone - as it helpfully reminds me of things each day, but for making appointments, I use a paper diary. I also plan each day out, a week at a time, roughly, to make sure everything I need to do gets done (work/volunteering/chores/appointments/exercise) and for this I use a piece of scrap A4 paper, torn in half. I prefer to re-use the blank side of already used paper for this, as it just gets recycled at the end of the week. I've always done this by hand, dividing the page into seven sections, with an extra section for 'next week' (forward planning!) and 'supermarket'. Doing this helps me see if I have too much going on on any particular day and gives me the chance to jiggle things around a bit. I have found online the most fantastic free printables which incorporate all sorts of different categories, such as keeping hydrated, from Life's a Journal. Or one that includes your children's activities, too, here, from Mommy Tracked. I love the illustrations on this planner, from Arian Armstrong - far too cute to hide away! Jana Laurene's weekly planner includes space for weekly and monthly goals, too. There's a nice simple one here, from About.com, with lots of space for freestyle planning! I'm going to try some of these out (printed onto the blank side of an already used piece of paper, of course) - if you don't plan your day/week, give it a go, it's amazing how much you can achieve! Thanks for visiting my blog. I am enjoying catching up with yours.